The show of work by Anne's former and current students, The Edison School at Orr Felt Factory, was a quintessentially Anne Vaccaro happening. 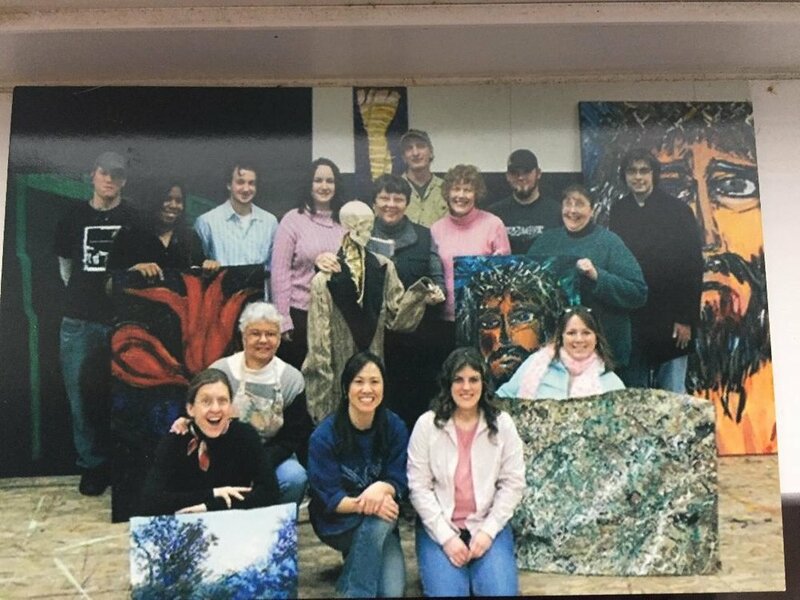 Anne had the acquaintance of Dimitri Nicholas, who had created an art gallery in unused space in his Orr Felt Factory in Piqua, OH, the home of Edison Community College. Anne planned and executed a show of her former and current students in this vacant space for February 12 through 17, 2007. It was a special way to honor the accomplishments of Anne's students, as well as her teaching legacy. A link is found below for the program for the show, which contains each exhibitor's reflections on her or his work and philosophy. A reception in the middle of the week the show was up was a peak experience of the arts. Pulling off the whole project took the kind of communal energy that was so much a fixture of Anne's outside the classroom and outside the box teaching. As with her other projects, this show and reception would not come off without the devoted and hard working students who put the whole thing together. It's hard to believe the Orr Felt Show and reception were almost 11 years ago. The show celebration, aka reception, was held on February 14, Valentine's day. There was a blizzard the day before, which was fortunately after the show had gone up. Even though we had gone to Dayton the previous weekend to stock up on provisions for the show, we still had to set everything up for the reception. As I recall, there was well over a foot of snow on the ground. Even so, the blizzard did not impair the reception in any way; the reception was heavily attended and glorious. There were numerous readings of their work by members of Edison Writers Club and others from the community, musicians playing and singing, and, most important, camaraderie, and a plethora of wonderful art to view. I remember wandering around transfixed by the scope of the art and the performances. It's too bad there is not a video tour of the show. I think the reception was just the right antidote for 36 hours of blizzard and being shut in. Here are links to a video (parts 1 and 2) interviewing Anne and the artists in the show. The videos were made by Paul Shuler and Jesse Shuler. Both are alumni of Edison State Community College, Piqua, OH. Some pages of the Orr Felt Show program below may not be oriented properly. If you click on an upside down page, a task bar appears at the top, and you can click on the rotation icon, which will rotate all pages. We are trying to fix this.